Scientific director of SOSF D’Arros Research Centre Rainer von Brandis relays some of the knowledge gleaned on the local marine and terrestrial environments of these remote islands in the Seychelles’ Amirantes Group. D’Arros Island (left) and St Joseph Atoll (right) provide a hotspot of biodiversity in the remote outer islands of the Seychelles. D’Arros Island and St Joseph Atoll are situated in the remote outer islands of the Seychelles. They form part of a small chain of islands that comprise the Amirantes Group, named for the bank on which they are situated. Mahé and the other inner islands of Seychelles lie 250 kilo­metres northeast of the Amirantes while Zanzibar is 1,400 kilometres due west. Because of their inaccessibility, lack of fresh water and infertile soils, the outer islands have long been regarded unsuitable for permanent habitation. Nevertheless, over the past two centuries small communities have existed transiently on some of the islands to grow coconuts, collect guano and catch fish. Today, conservation and tourism are the main activities on the outer islands. Although D’Arros Island and St Joseph Atoll are separated by a one-kilometre wide and 70-metre deep channel, they are considered a single ecological unit as their ecosystems are inextricably linked. D’Arros Island and the 16 islands that comprise the St Joseph Atoll are relatively young (circa 5,000 years) sand cays. D’Arros Island is oval shaped and about two kilometres at its widest axis, which means you can walk around its uninterrupted sandy beach in less than two hours. St Joseph Atoll consists of a circle of 16 islands that have a combined landmass just less than D’Arros. These islands are situated on a shallow reef flat that encircles a central lagoon of 3.5 kilometres in length and 3 metres in average depth. During the low tide, marine organisms are trapped in the lagoon because the reef flat becomes entirely exposed. As the tide rises again, water spills back over the reef flat to eventually lap against the beach crests of the islands. Most of the rain falls during the northwest monsoon, between December and March. For the remainder of the year the island is subjected to moderate southeasterly winds and relatively dry weather. Air temperature varies between 25 and 35°C while the sea cools to 24°C in winter and warms to 31°C in summer. One of the largest known Aldabra giant tortoises (Aldabrachelys gigantea) lives on D’Arros island. D’Arros and the islands of the St Joseph Atoll are flat and sandy. Scattered throughout the interior of the larger islands, a rocky layer of fossilised guano lies beneath the surface of the sand, giving testament to bygone seabird colonies. The beaches consist of uninterrupted soft white sand and are fringed by gentle lapping waves on one side and coconut palms on the other. Although coconuts are indigenous to the region, they are normally restricted to the beach crests of islands as they are unable to penetrate existing tropical forests. However, when the interior is denuded of native vegetation, coconut palms quickly occupy the open space to form a dense jungle devoid of other plant species. Unfortunately, by the late 1900s this fate had overcome most of the outer Seychelles islands. D’Arros and the seven largest islands of the St Joseph Atoll were no exception and today 90 percent of the vegetation on these islands is dominated by coconut. The remaining 10 percent comprises casuarina trees and small patches of indigenous broadleaf forest interspersed along the beach crest and among the coconuts. While a jungle of coconuts might seem aesthetic­ally pleasing, it is extremely low in biodiversity. This quickly becomes evident when you attempt to slash your way into the dense jungle on D’Arros. Apart from a few skinks, spiders and several million mosquitoes, there is very little life. If the natural forest had been left undisturbed, you would likely have encountered several species of land bird feeding on a diversity of insects and fruits; giant tortoises lumbering around on the open forest floor; crabs and skinks scuttling about and seabirds nesting in the leafy canopy overhead. Fortunately there is a very strong conservation ethic in Seychelles and several vegetation rehabilitation projects are currently underway. D’Arros Island has taken a lead role in this initiative as it facilitates the most extensive forest rehabilitation programme in the region using an innovative, low cost and effective technique that was devised on the island. Encouragingly, large numbers of seabirds have already begun nesting and roosting in the rehabilitated areas, raining down the nutrient rich guano that is required to kick-start natural ecosystem processes. In the southeast of the atoll along the inner shore of St Joseph Island, there are a series of muddy channels flowing between rocky shelves of fossilised corals. Small stands of mangrove grow in these channels and along the inner rim of most of the other islands in the atoll. In the past, mangroves were heavily exploited for their bark and thus it is believed that they were once far more common in the atoll than they are today. Although these remnant mangrove stands are expanding again, the D’Arros Research Centre is accelerating this process by planting propagated mangrove seedlings in strategic areas. Mangroves are a vital component of lagoon ecosystems as they provide food and shelter for a diversity of marine creatures; act as a nursery for fish, sharks and rays; provide nesting habitat for seabirds; act as a nutrient trap; offer a valuable food source for many species and reduce coastal erosion. Blacktip reef sharks (Carcharinus melanopterus) hunt along the reef crest and shallow reef flat at dusk. The marine environment surrounding D’Arros Island and St Joseph Atoll boasts a diversity of habitats and species. Compared to the other islands in the Amirantes, marine ecosystems are significantly healthier because, over the past four decades, the private owners have done much to preserve habitats, reduce fishing pressure and limit poaching. The lagoon, which has a maximum depth of 6.5 metres, is divided into a series of basins by parallel flat-topped reef ridges or so-called ‘ribbon reef’. These ridges, of which the tops emerge during low tide, support thick growths of seagrass frequently visited by foraging turtles. The bottom is sandy and interspersed with patches of temperature-resistant corals that provide shelter for a host of fishes, crustaceans, turtles and rays. Because sediment is transported over the reef flat on the incoming tide, the water in the lagoon is generally warmer and turbid. The surrounding reef flats are periodically exposed during low tide but in some places, shallow pools and lower lying areas are permanently inundated with water. In the southeast of the atoll, where the inner reef flat is protected from wave action and tidal currents, millions of fiddler crabs emerge from their holes at low tide to feed on fresh silt deposits. Using their claws and mouthparts the crabs work over the entire surface of the reef flat, leaving behind small balls of filtered sand. As soon as the flats are submerged again, stingrays arrive to dig out these crabs and other burrowing creatures. Shark pups and bonefish flood over the flats with the rising tides to hunt for sprats and shrimps. 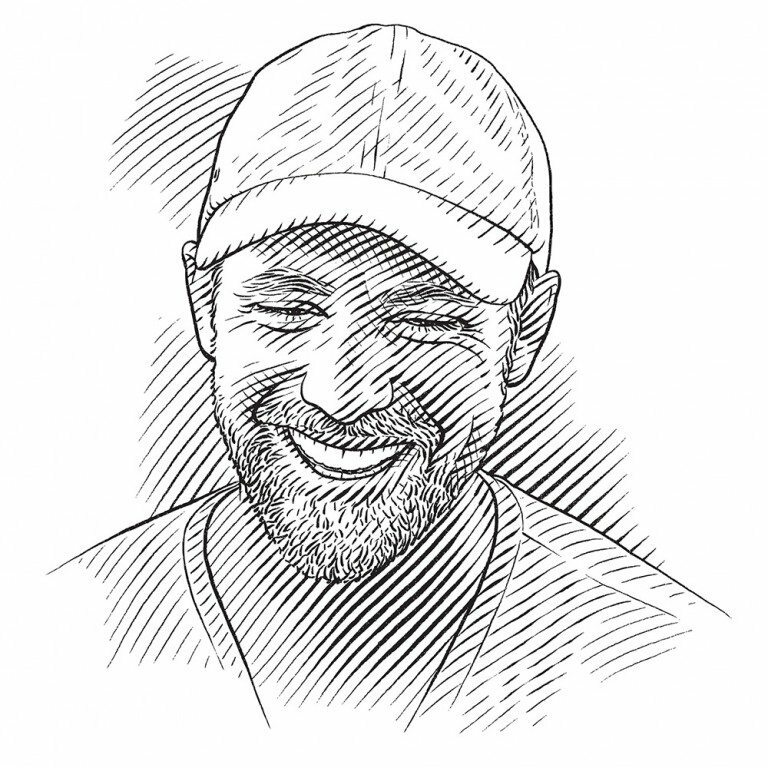 On the high tide, larger sharks arrive in search of rays, bonefish and shark pups. Where it meets the open ocean, the reef flat is replaced by a coral reef that descends down a slope to about 25 metres, where it abruptly meets a sandy plateau. Along the northern shores, the reef slope is steep and, in many places, completely covered by corals. In the south, the reef slope is more gradual and corals more sparse. Apart from corals, other prominent benthic life forms on the reef slope include soft corals, gorgonians, sponges, algae and zoanthids. The coral reefs have recovered well since the devastating coral bleaching event in 1998, when approximately 70 percent of the corals in the Seychelles died due to global warming. Every year large areas that were previously devastated are inundated with thousands of juvenile corals. Corals are the building blocks of tropical marine ecosystems and we have noticed a steady increase in macroinvertebrates, fishes, stingrays and even the larger charismatic species including sharks, manta rays, dolphins and turtles. Potato cod (Epinephelus tukula) are known for being friendly and inquisitive. Blacktip reef sharks and sicklefin lemon sharks thrive in the shallow lagoon and reef flat habitats of the atoll. Both species use the lagoon for breeding purposes and shark pups can be seen patrolling the shallows all year round. Other sharks regularly encountered around the islands are whitetip reef, tawny nurse and grey reef sharks. Bull sharks and hammerheads are less common but have been encountered on several occasions. Further out to sea where the Amirantes bank drops off into the deep, silvertip, silky and oceanic whitetip sharks have been seen. Hundreds of endangered hawksbill and green turtles nest on the beaches of D’Arros and St Joseph every year. 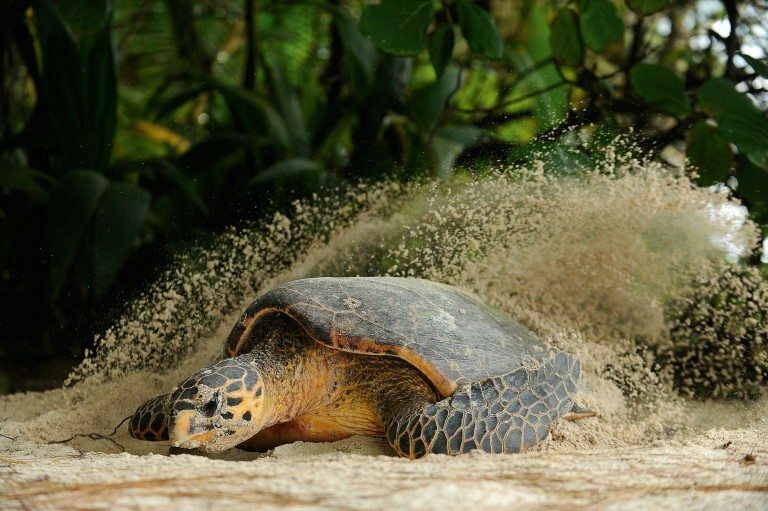 While green turtles emerge to nest at night, hawksbills nest in the daytime, a phenomenon that is unique to the Seychelles. The shallow marine environment at D’Arros and St Joseph provide crucial developmental habitats for juvenile green and hawksbill turtles, the numbers of which probably range in the thousands. Green turtles graze seagrass on the reef flats during the high tide and when the reef flats become exposed on the dropping tide the turtles retreat to the deeper lagoon or the adjoining coral reefs to rest. A leisurely dive along the reef crest during the low tide can yield more than 30 turtle sightings. 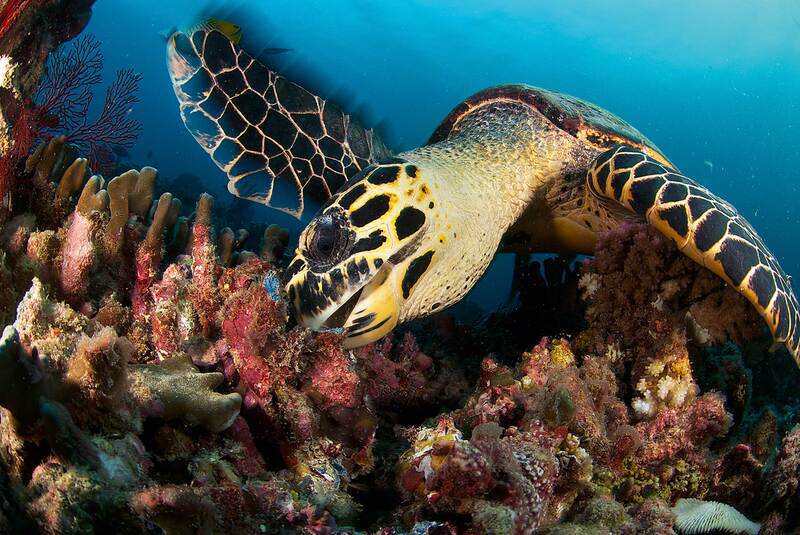 Hawksbills forage in a variety of habitats seeking out sponges and zoanthids. The most preferred habitat is the shallow silty region in the southeast of the atoll as it is rich with their food. It is a long way to deeper water from there so turtles are forced to sit out the low tide in small stagnant pools on the reef flats, often tolerating water temperatures in excess of 37 degrees. These turtles are clearly distinguishable from others as their lack of contact with the open ocean ensures that they are covered from head to flipper in green algae! A Hawksbill turtle (Eretmochelys imbricata) prepares its nesting site on the beach crest of D’Arros Island. A juvenile hawksbill turtle feeds on sponges. Bohar snappers (Lutjanus bohar) are one of the most common predatory fish on the coral reefs surrounding D’Arros and St Joseph. Three gecko and one skink species are ubiquitous around the islands and a small reproductive population of Aldabra giant tortoises exists in the open grasslands adjacent to the village and gardens. The fish species assemblage numbers more than 300 and includes the entire trophic spectrum of herbivores, corallivores, invertivores and piscivores. Large shoals of beautifully coloured fish of a variety of shapes and sizes swarm over the outer coral reef, occasionally darting about in unison to avoid attacks from predatory fish such as tuna, trevallies, snapper and barracuda. In the atoll, bonefish, permit, trevallies and barracuda chase sprats into the shallows, gulping down mouthfuls of them at a time. Manta rays circle D’Arros Island and St Joseph Atoll year round feeding on plankton aggregations as close as 20 metres from the beach. Groups of eagle rays are often encountered patrolling the reef edge and inquisitive stingrays spanning up to two metres in disc-width rise up from the ocean floor to confront divers before darting off. Bottlenose, spinner and Risso’s dolphins are regularly spotted around the islands while melon-headed whales, short-fin pilot whales and humpbacks are less common. D’Arros Research Centre was built in 1994 and tasked with conducting scientific research to better understand and manage local marine and terrestrial environments. The islands were uninhabited when they were officially discovered in 1771 during a French exploratory mission from Mauritius and named after Baron d’Arros, the French Naval Commander at the time. A small community of less than 20 Seychellois settled on the islands in the mid 1800s to establish a coconut plantation. By the early 1900s the community had grown to more than 100 and more than 90 percent of the natural vegetation had been converted to coconut plantation. The community was also extracting guano, logging mangroves and curing fish and turtle meat for the local market. By the 1970s Asia was dominating the coconut oil market and most of the outer island plantations were abandoned. In 1974 D’Arros and St Joseph came under private ownership and soon coconut production ceased and discreet conservation policies were implemented. Today, the population on D’Arros numbers between 30 and 40 while the Islands of the St Joseph Atoll are once again uninhabited. Of the five land bird species existing on D’Arros and St Joseph today, the turtle dove and the Seychelles fody are believed to be native while the house sparrow, Madagascar fody and the zebra dove were probably introduced by humans. However, once a significant portion of the vegetation has been rehabilitated, certain land bird species that are endemic to the Seychelles will be reintroduced. Three heron species occur of which the grey heron and green-backed heron are breeding residents. No less than 15 migrant wader species have been recorded with the ruddy turnstone and crab plover being the most common. A juvenile fairy tern (Gygis alba) waits patiently for its parents to return with a meal of fish. Fairy terns (Gygis alba) are excellent fishermen and thus can afford to spend a great deal of time socialising or resting. More than 1,000 greater and lesser frigatebirds and 1,500 lesser noddies roost on the islands at any one time. These birds breed at other locations and use D’Arros and St Joseph as a convenient stopover or as a routine perch from which to go on daily fishing forays. 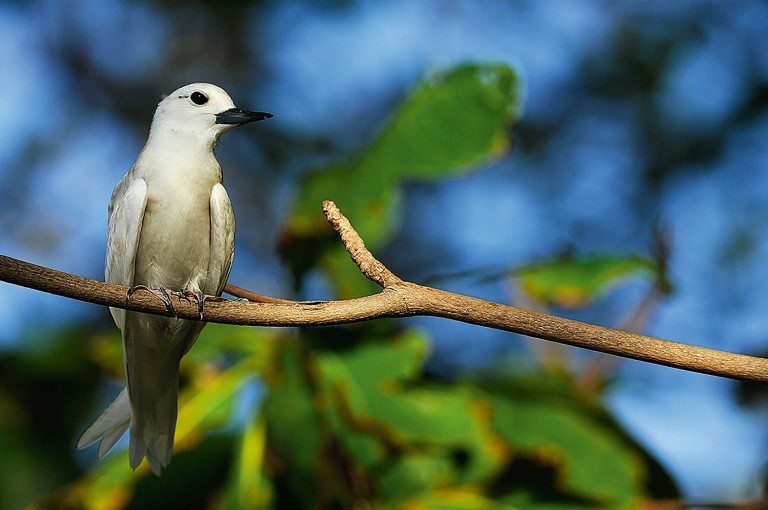 noddies, 50 pairs of common noddies, 15 pairs of blacknaped terns and 10 pairs of white-tailed tropic birds. The roseate tern and shearwater colonies are of particular importance as they are the second largest in the Seychelles. The roseate terns usually arrive in June and settle in a single noisy colony somewhere along a remote beach crest in the atoll. A breeding pair usually produces one or two chicks but breeding success is strongly dependent on predation rates from grey herons and hermit crabs. More than 90 percent of the wedge-tailed shearwaters breed on Fouquet Island in the atoll. 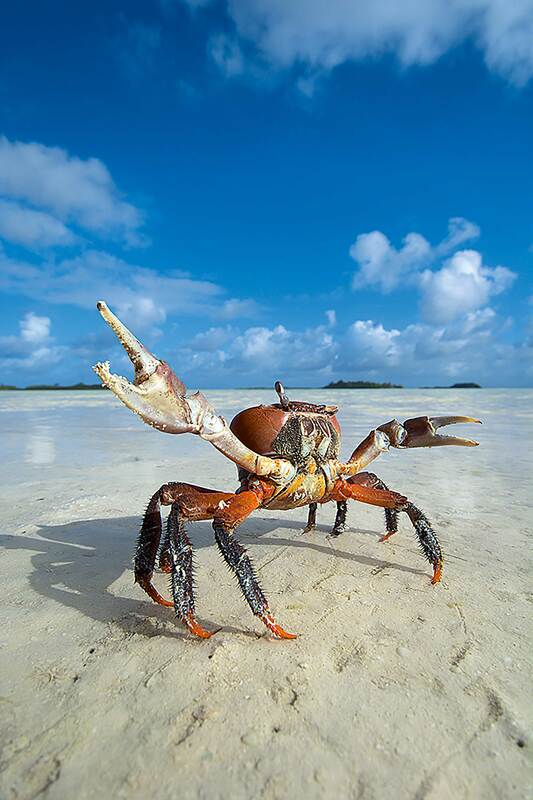 Massive land crabs are common along the beaches of the atoll, and hermit crabs hide in the shady forest by day but at night, millions migrate to the beach to feed on anything that the tide has washed up. Ghost crabs are also abundant, and giant robber crabs are slowly making a reappearance despite going extinct in the Amirantes several decades ago.